Climb Aboard And Enjoy Inclusive Play Spinning With All Your Friends! 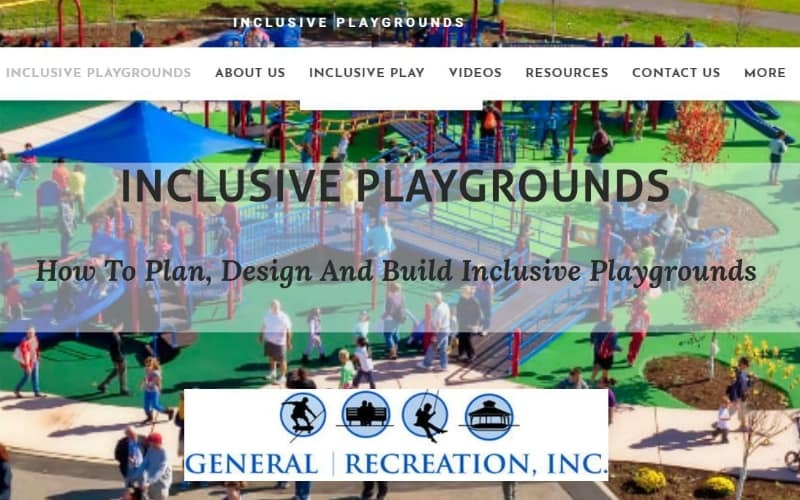 This patent pending next-generation merry-go-round offers plenty of inclusive play for kids of all abilities. Strategic seating areas leave ample room for wheelchairs, including those without a wheel-locking mechanism. Once aboard, everyone faces the center so they can easily share smiles, laughter and conversation while in orbit. Under rooftop shade, riders can participate in the action using the center handhold while others are turning from the outside. The built-in resistance mechanism maintains a reasonable maximum speed, ensuring all spins on the We-Go-Round™ remain fun and safe. Finally, an Inclusive Seesaw for Everyone! The We-saw™ is a new take on the traditional seesaw. Its unique design and gentle rocking motion invites kids and families of all ages and abilities to participate in the activity. The We-saw is wheelchair accessible. Like all of our inclusive play events, the We-saw provides opportunities for collaborative play and teamwork. Center platform made of GripX, a UV stabilized HDPE (high density polyethylene) marine-grade material. Specially designed slip resistant texture enhances traction and appearance. Platform is trimmed with your choice of colorful Permalene®. Climbing and Turning at the same time. The Global Motion™ brings it all together. 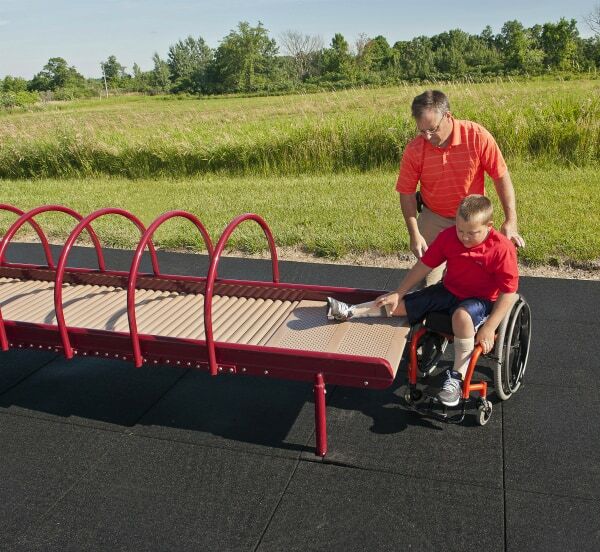 This unique freestanding rotating climber offers plenty of activities; turning, climbing, socializing and running; while requiring a team effort to keep it all going around. Children of all abilities enjoy this inclusive ride. You’ll appreciate its progressive resistance mechanism, our proprietary technology that keeps Global Motion at a fun yet controllable speed. It’s another way that Landscape Structures continues to lead with innovation. 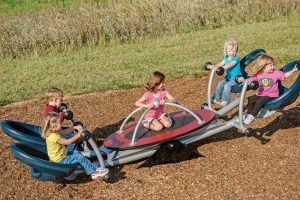 The inclusive Global Motion rotating climber invites and entire group to climb aboard and go for an orbital ride. Kids can take turns climbing multiple nets, socializing on two levels and pushing. In fact, you’ll find kids enjoy pushing as much as riding. All aboard the OmniSpin™ Spinner! This truly inclusive spinner balances physical accessibility, age and developmental appropriateness, and sensory stimulating play for children of all abilities. This patent pending spinner offers back support and side walls that make spinning safe and fun, and the speed limiter ensures youngsters feel secure when taking a twirl. 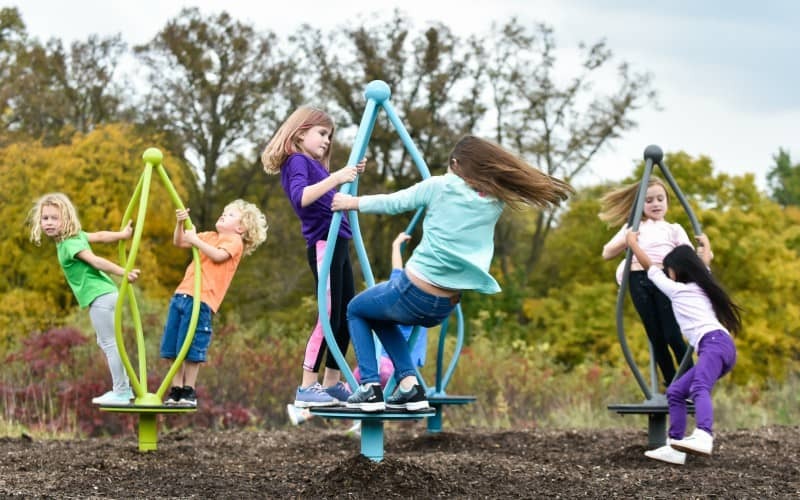 A go-round on the OmniSpin Spinner provides lots of social play, along with valuable vestibular stimulation, an important component in the development of proper balance and posture. 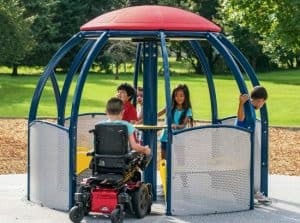 With an accessible transfer height entrance from a wheelchair or walker, scores of youngsters will find the OmniSpin Spinner to be a fun, comfy space for interactive and cooperative play. 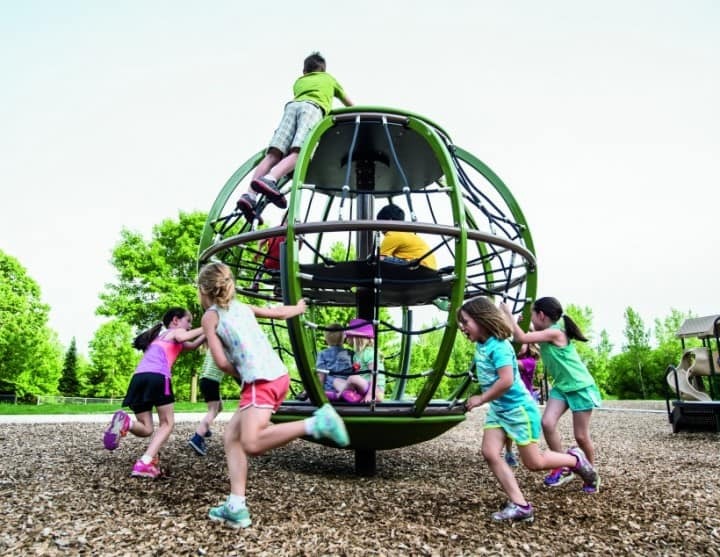 The OmniSpin spinner is the perfect freestanding spinning activity to accent any new or existing playground. Made from durable, color fast, vibrant polyethylene. Watch the OmniSpin Spinner in action on the playground in the video below. Bring oodles of fun to oodles of kids with the Oodle™ Swing. 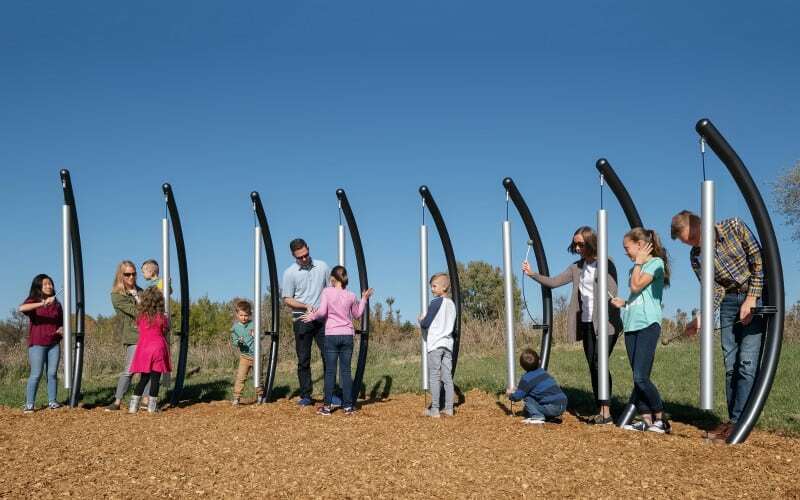 This multi-user swing encourages interactive play by inviting the whole gang along for a ride. Molded from durable, colorfast polyethylene, the Oodle Swing provides valuable vestibular sensory stimulation for kids of all abilities. Allowing children to experience motion in a variety of positions and speeds can help improve their balance and posture. 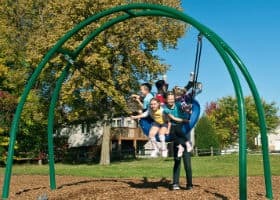 Youngsters can choose to share a swinging good time with their friends, or they may prefer to use the Oodle Swing as a quiet respite from the rest of the playground activity. Either way, they’re sure to have lots of fun! Check out the Oodle Swing Video below. All inclusive all the time. 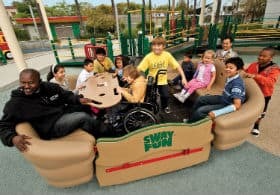 There’s nothing else on the playground quite like Sway Fun®, the first totally inclusive glider for kids and adults of all ages and all abilities. It features ample room for two wheelchair passengers. Twin bench seating accommodates lots of friends and family. Also included are three bench and two wheelchair handholds, and an interactive Permalene® play table with dual cup holders. Plus, Sway Fun is ADA compliant. Sway Fun’s fully encased glider mechanism enables riders to control the tempo – back and forth, from mellow to merry. 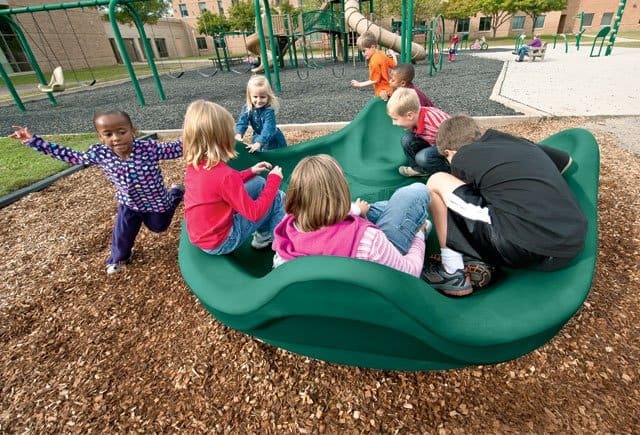 Even better, Sway Fun is compatible with any Landscape Structures PlayBooster® and PlayShaper® system. You can also install Sway Fun as a stand-alone play event. To withstand constant use, it features Permalene side panels; double-walled, rotationally molded polyethylene sides and backs; heavy-duty galvanized steel deck with finger and feet friendly TenderTuff™ coating; as well as vandal-resistant, stainless steel fasteners. Watch the inclusive SwayFun video below. Crawl on, rumble along; the Sensory Play Roller Table provides kids much needed sensory stimulation, through the application of deep-muscle pressure from the steel rollers. Children have a chance to exit their mobility devise and have the unique Roller Table sensation that they might not have ever experienced. Children can play on the Roller Table alone our in groups. It is large enough to accommodate several children at once.